The Toyo Kisen Kaisha has to be congratulated on the prosperity of its business brought about by the war. The company, which had long been in straitened financial circumstances, is now able to declare a dividend of 12 percent on new shares and 7 percent on old shares for the first half-year term just closed. The withdrawal of the British and German steamers from the Oriental service consequent upon the war and the subsequent discontinuance of the Oriental line of the Pacific Mail Steamship Co. account for the sudden turn for the better. With no rival foreign steamship concern extant, the Toyo Kisen Kaisha has come practically to monopolize the San Francisco line. Mr. Shiraishi, managing director of the company, says the company was able to redeem ¥1.4 million of an ¥8.7 million loan made at the end of the last term, and supposing the favorable business conditions are to continue for some three years or so, the company will be able to clear all of its liabilities, which now stand at ¥7.3 million. Japanese forces entered French Indo-China early today, in accordance with an agreement between the Japanese and French (Vichy) authorities. 1. That the Japanese and French governments have concluded an agreement of military importance. 2. That, despite the agreement, a skirmish occurred when the forces entered presumably because of a misunderstanding on the part of the local French Indo-Chinese troops. Although no details of the agreement have been revealed, it is understood the French authorities, as a result of negotiations conducted both here and at Hanoi since some time last month, are to offer facilities for Japanese military operations in Indo-China. The sources of energy used for the generation of electric power in Japan have been progressively switched from hydraulic power to coal and then to heavy oil. The country is now preparing to develop nuclear energy as a new source of energy from the standpoint of economically securing fuel required for steam power generation. The demand made on Tepco is expected to reach 17.89 million kw by 1973. 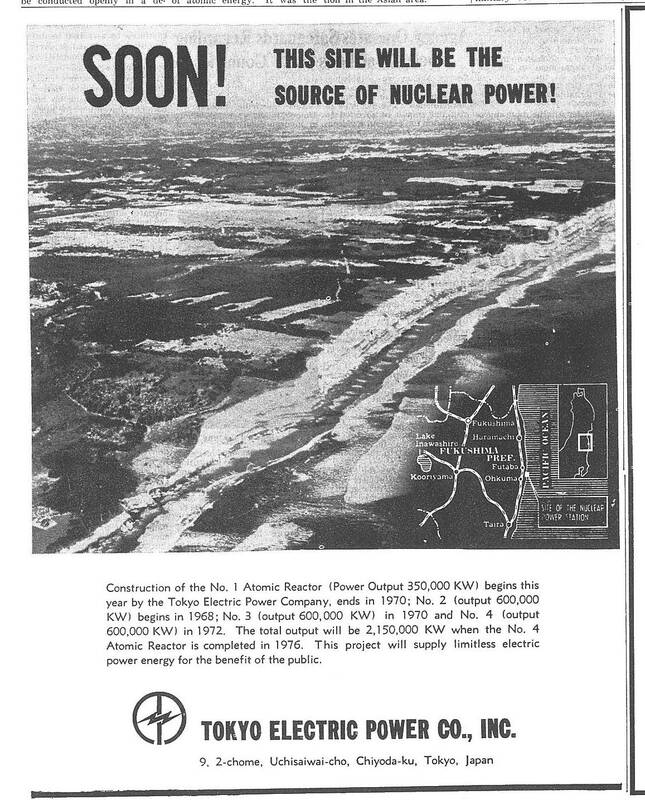 Tepco’s program for nuclear power generation calls for the development of about 2 million kw by 1975. The move is expected to result in the conservation of about 3 million kiloliters of heavy oil, or about one-fifth of the total amount of crude oil needs. Tepco has constantly kept busy making preparations, doing research and conducting other studies since setting up an atomic energy generation section in 1955. A land area of about 2 million sq. meters was acquired for this purpose in November of last year along the coast stretching from Okuma-machi to Futaba-machi of Futaba-gun, Fukushima Prefecture. Plans have been made to install the first and second reactors at this point. The enriched uranium light water model is scheduled to be used as the first reactor. The Fukushima Research Center was established last December for the purpose of conducting on-the-spot research. In order to collect enough data needed for ensuring the safety of the atomic power plant and its construction, the center is now busy at work on meteorological observation, geological and oceanographic surveys along with seismographic and subterranean observations — all of which are broad and time-consuming projects. A study is underway to determine the water pumping formula for the cooling system, but a tentative plan calls for the acquisition of water directly from the sea through the construction of breakwaters. A new committee, an advisory organ to the president is headed by Naojiro Tanaka, an executive director. It is in charge of drawing up blueprints for the atomic power plants and for making other arrangements necessary for launching the construction. Another committee was organized this past July, also under the chairmanship of Tanaka, to work on the problem of earthquake-proofing and other technical matters regarding the construction. This committee is made up of academic and engineering experts, both inside and outside the company. Thus busily engaged, Tepco is moving steadily ahead toward its goal. The Tokyo Metropolitan Government will adopt a policy of using plastic chopsticks instead of wooden ones at restaurants inside its new office building in Shinjuku next March, when the high-rise opens. The move is designed to reduce waste and conserve natural resources, a metropolitan government official said. According to the official, over 2,500 pairs of wooden chopsticks are discarded daily at three public restaurants for government employees in the current office building at Marunouchi, Chiyoda Ward. In this feature, which appears on the first Sunday of each month, we delve into The Japan Times’ 117-year archive to present a selection of stories from the past. This month’s edition was compiled with the assistance of Yuki Hayashi.